6) Competitive price and quick delivery. Wall cladding, facades, roofs and canopies, tunnels, column covers or renovations. Wall cladding, ceilings, bathrooms, kitchens and balconies. Display platforms, signboards, fascias and shop fronts etc. 4) PE-incore is from SINOPEC QILU COMPANY LTD.
5) Adhesive polyfin film is made by SK Korea, more than 90 degrees. Conventional metal tools and wood tools can be used. It can be cut, sawed, roued, bended and bonded with adhesive or double-face tape. After processed, it can still keep the beauty and be easily cleaned. 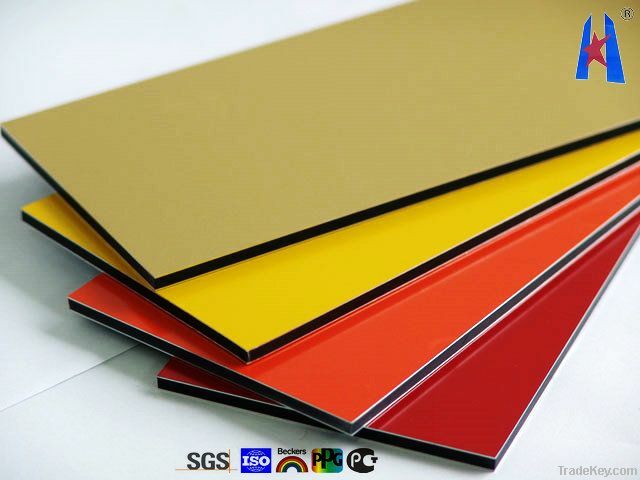 FAL fire-proof aluminum composite panel, a new type of composite material, using fire-proof material as the core, quality coated aluminum alloy panel as the cover plate, produced with advanced technology, has excellent fire resistence, reaching GB8624 grade B1 (the China national standard of fire resistance).